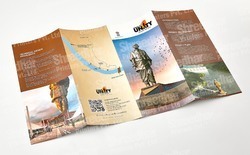 We are a leading Service Provider of tri - fold brochure printing from Ahmedabad, India. Color C M Y K, Pantone Color Printing. A card is a great idea to make a special event in your life like birthdays, anniversaries and marriages memorable for people important to you. Use printand’s postcard printing service to get a great quality postcard that you’d always be proud of. Looking for Flayer Printing ?